Season Two of Ballers builds upon the plot of Season One and takes it a step further and deeper. Ballers is an HBO series that first aired in 2015. It's a show that looks at NFL agents and athlete and the problems that they go up against dealing with the sports agencies, greedy owners, and the increasingly money-driven NFL itself. Season One was a solid show and kept enough interest for HBO to renew Ballers for Seasons Two and Three. With Season three filming in California, The Season Two Blu-ray and DVD heads to stores on January 31, 2017. Former NFL player Spencer Strasmore (Dwayne Johnson; Central Intelligence) is a mess. He is a washed up, broke, forty year old (which is apparently, ancient in the NFL World), has been NFL player. Spencer ends up mentoring young football players as a financial advisor/mentor where he partners up with Joe (Rob Corddry; Hot Tub Time Machine). Together, they will do almost anything necessary to help these guys obtain financial stability for both the present and future. Season Two of Ballers builds upon the plot of Season One and takes it a step further and deeper. Season Two emphasizes the continued downward spiral of Spencer. Not to give away the ending but, its seems as if Spencer hit rock bottom, having to admit that he will never have a career the way he wants. His health is failing, his girlfriend is leaving him and his archenemy, Andre Allen (Andy Garcia; Ocean's Franchise) is stealing all his clients. Other characters also provide a real feel to the plot. Newcomer draft pick Travis Mach (Adam Aalderks; Curveball) seems to provide some real interest and lots of excitement for Spencer to deal with. Another player hurts himself playing paintball and jeopardizes his contract. Ricky, (John David Washington; Malcolm X) listens to his estranged father instead of his agent about career choices. Charles (Omar Benson Miller; 8 Mile) loses his NFL position in Miami only to be given a job with them as front office management. The majority of Season One's cast returns for Season Two, bringing a sense of continuity and familiarity to the characters. As the Season continues and the plot develops, you start becoming invested in the characters outcomes. Feeling sorry for Spencer is one feeling and confusion over Ricky's choices is another. Johnson's movies have always interested me, and while many of them have at some point fallen short, his performance in Ballers reminds me why, in the past, we flocked to the theaters to see some of the cheesy Johnson films. Teaming up with Corddry they play off of one another and their characters seem to have a flawless chemistry that work in a non-romantic type of way. They are the epitome of a "bromance". Other characters, such as Garcia, Dule Hill (The West Wing), Richard Schiff (The West Wing) Jazmyn Simon (Baggage Claim) and Ariella Kebbel (The Vampire Diaries), provide stunning support that Season Two of Ballers and it is like watching your favorite team's defense putting points on the board. The Digital HD has 1080p high definition video quality that is sharp and clean and truly accentuates the gorgeous South Florida scenery. Likewise, the DTS-HD Master 5.1 audio shows off the soundtrack that is mostly permeated by todays hottest Rap and Hip Hop artists. The mix of dialogue and music is a little off, but not as glaringly as with other products. Audio quality is crisp and clear and, depending on your sound system, the English DTS-Master Audio 5.1 provides a wonderful listening experience. When I'm reviewing a Blu-ray for audio quality, I take notice of how many times I need to adjust the volume. Ballers is definitely at the lower end of that scale, which rates an A in my book for audio quality. Extra features on the Blu-ray are much more streamlined than a movie but Ballers does a good job with their extras. Each episode contains "Inside the Episode" bonus segments which feature interviews with executive producer Evan Reilly, as well as out favorite agent, Dwayne "The Rock" Johnson. While I can never say that any of my preferred genres are sports show, Ballers does do a surprisingly good job at developing the depth of its characters. Season Two definitely kicked the ball out of the stadium and it will be interesting to see if they can keep the momentum in Season Three. Nonetheless, HBO has created an entertaining series that may continue for a few more seasons. 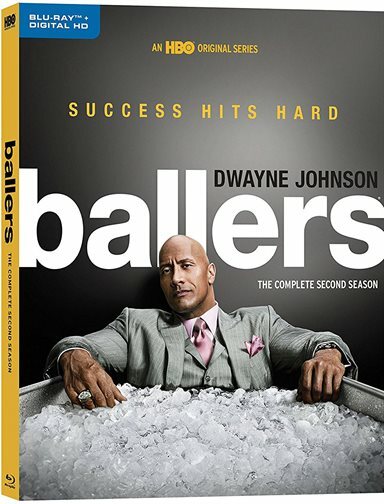 Download Ballers: The Complete Second Season from the iTunes Store in Digial HD.